The BARSKA Anchormaster 36x80mm Brass Refractor Telescope with Mahogany Floor Tripod is a stunner from the first moment you look at it. It combines excellent optics with a vintage-style design (even steampunk, some would say). The BARSKA Anchormaster 36x80mm Brass Refractor Telescope with Mahogany Floor Tripod is a great example at what the BARSKA opticians can do, at a intermediate-to-professional range of telescopes. Definitely not an optical instrument for beginners, though it’s affordable for its niche. Today we will take a closer look at the BARSKA Anchormaster 36x80mm Brass Refractor Telescope with Mahogany Floor Tripod, a telescope so beautiful it can be used as a showpiece for a room or an office. Is it a good, performing telescope for deep sky viewings? Is it as good as it looks? Let’s find out together! What is the BARSKA Anchormaster 36x80mm Brass Refractor Telescope with Mahogany Floor Tripod? You know that all the best Barska telescopes feature an excellent design, but the Barska Anchormaster telescopes series looks like something rich lords and explorers would use. 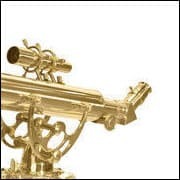 The brass tube and accessories, together with the mahogany tripod are quintessential design elements that added to the company’s reputation, and the Barska company reviews are very clear about that. But beyond looks, we are interested first in the tech specs, so let’s start this BARSKA Anchormaster 36x80mm Brass Refractor Telescope with Mahogany Floor Tripod review by detailing them. Refractor telescopes are versatile enough to allow both sky viewings and terrestrial observations, and the focal length of this telescope (800 mm), together with its power (36x) seem to do the trick. The 80 mm objective lens (aperture) with the 25 mm Plossl eyepiece makes a good argument for good viewings of the night’s sky. Here we have only one eyepiece – which is interchangeable, nonetheless – which also presents a rack-and-pinion focuser and, more importantly, fully coated achromatic lenses which should deliver crystal clear, crisp and brilliant images of the Moon, planets and even deep sky objects. 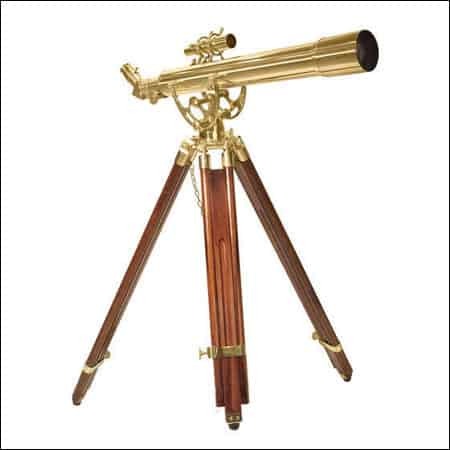 Talking about night gazing, we have to emphasize on the fact that this product comes with brass cradle mounts so you can move the telescope in all directions in a smooth manner, so you can pinpoint and focus on the objects you are looking for. We also said that, just like many other great BARSKA telescopes, this one is good for land viewings as well, as the 45-degree erecting diagonal allows correct such observations with little to no distortions. 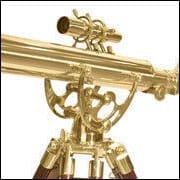 Last but not least, this product is an important element of the Barska brass telescopes series, a piece of equipment which looks like satisfying both needs for astronomy and aesthetics in the same time. Good quality optics, including Plossl fully coated achromatic lenses. 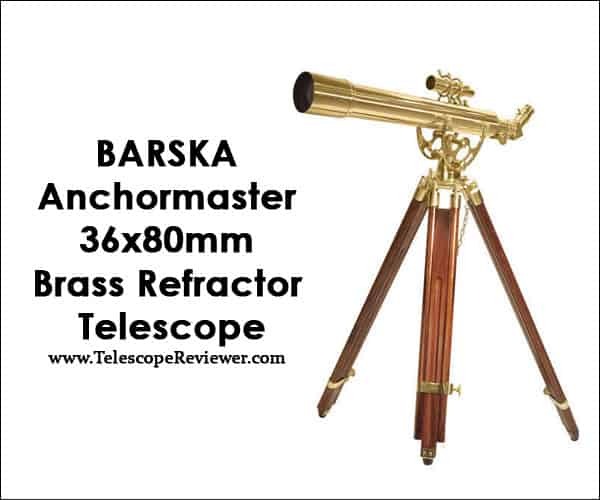 Some BARSKA Anchormaster 36x80mm Brass Refractor Telescope with Mahogany Floor Tripod ratings and reviews even go as far as naming them ‘exceptionally good optics’. The mahogany tripod adds to the overall elegance of the telescope. 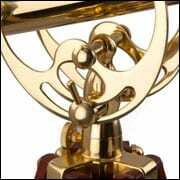 Where to find the BARSKA Anchormaster 36X80 mm Brass Refractor Telescope with Mahogany Floor Tripod? You will find the BARSKA Anchormaster 36x80mm Brass Refractor Telescope with Mahogany Floor Tripod for sale on Amazon, at the best price of $817.22. As you can clearly notice, this is not a product that falls into the category of affordable telescopes for beginners, but it can be included in the category of affordable professional telescopes. Keep this telescope safe from dust and humidity, clean the lenses with microfiber cloths and also prevent it from being the victim of accidents and falls. Barska has a wide range of accessories for its telescopes, so you will find available different types of lenses, eyepieces and accessories, should you want to customize and upgrade your telescope. Barska offers a 1-year limited warranty for normal wear and tear of the product, including repairs and replacements. Our BARSKA Anchormaster 36x80mm Brass Refractor Telescope review is favorable of the product and we highly recommend it. Just a quick glimpse at this luxury telescope could convince anyone of the quality and perfomance of this great scope. Reuniting a classic vintage design with the high performance of contemporary telescopes, this model is a great buy for anyone willing to invest a bit more in their optical instrument. This is indeed a good telescope, as the optics sport good features and the Plossl lens is a statement of quality, but the high price makes this telescope out of reach for many beginner astronomers. If you’re more interested in performance and less in design, this price range can allow you to buy other telescopes of the same functionality, but with a much less interesting look. For centuries mankind was fascinated with the sky and celestial objects and tried to build instruments in order to pierce beyond and understand the mysteries of the universe. Again, for centuries, mankind wanted to see better, for all possible reasons, and built pieces of equipment to be able to have a closer look at objects and people even at long distances. Telescopes are now more than a scientist’s daily tools, but items meant for the amateur astronomer and nature lover to use and enjoy. And when such a telescope comes in a vintage, antique and elegant design, looking like a work of art, the satisfaction skyrockets. Therefore, we wholeheartedly recommend you the BARSKA Anchormaster 36x80mm Brass Refractor Telescope with Mahogany Floor Tripod, even with its minor drawbacks. 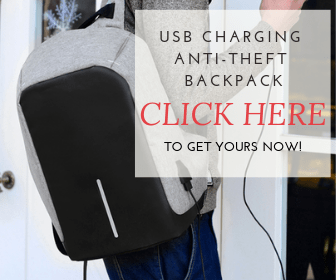 It’s a great collection piece to use and to display anywhere.